Dubuque, Iowa: NASCAR Dodge Weekly Series racing action went on Sunday night despite over an inch of rain in the Dubuque area early Sunday morning. The recent wet weather made for some testy conditions on the track but the drivers were able to provide the fans with an entertaining night of racing. Second year Late Model driver Dan Shelliam scored his first win of 2004 topping a strong field of competitors. Shelliam took to the low side of the track early and took over the top spot on lap number 9 overtaking fellow second year driver Jeff Tharp. The two young drivers went on to put on a great race with Shelliam coming away the 3M race night winner. Tharp followed closely in second ahead of Bobby Hansen, Jeff Aikey and Rob Moss. Ron Barker continued his recent hot streak by winning another NASCAR Modified feature on Sunday night. 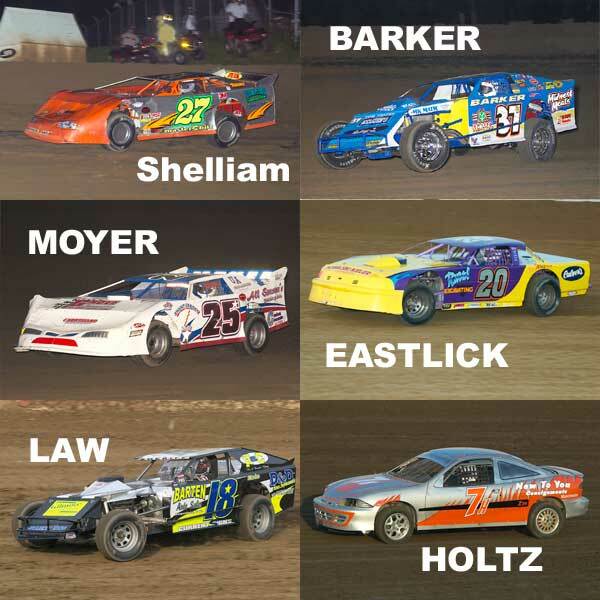 The win pushed Barker�s streak to 6 feature wins in a row. Barker took over the lead with 8 laps remaining and went on to take the checkers ahead of Jason Schueller and Mark Schulte. The NASCAR Pro Stock feature provided the fans with plenty of close racing and a very scary accident. On lap number 5 Keith Kiernan lost control of his car and vaulted off of turn number 2 and landed over the bank and went into a series of barrel rolls. Kiernan escaped injury in the spectacular accident. On the restart Bobby Moyer took the lead and went on to lead the way the last ten laps. Jim Brokus applied pressure late in the race but settled for second at the finish line. Jason Robbins and Mike Hughes rounded out the top four. The Hobby Stock feature was also red flagged following a roll over by Jason Riechers. The drive shaft broke in Riechers car and dug into the track sending him flipping end over end. Riechers quickly climbed from his car unscathed. Jarvis Eastlick led the 10 lap feature race flag to flag picking up the 3M race night trophy. Ed McIntyre ran second ahead of Jason Rauen and B.J. Schmitt. Recent high school Grad, Travis Law scored his first ever NASCAR B-Modified feature win on Sunday night in holding off defending track champion Mark Massey. Law drove a flawless race in scoring the impressive win. Jake Seegmiller and Jed Frieberger completed the top four. Phil Holtz led approximately 30 feet of the ten lap Farley Flyer feature on Sunday night and it was the thirty feet that earned him the feature win. Holtz beat Brian Kammerude to the checkers by a few feet. Joe Zrostlik and Becky Roth rounded out the top four. NASCAR racing will continue at the Dubuque County Fairgrounds Speedway with a special Fathers Day edition of racing on Sunday, June 20th. Hot laps will take to the track at 6 p.m.